It is believed that salmon evolved with a group of higher bony fish 70 million years ago. 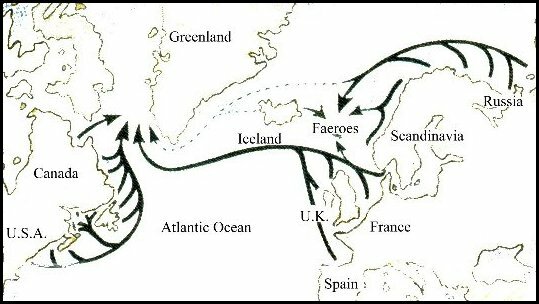 Atlantic salmon spread throughout North America, Europe and Iceland before the land masses separated. It is thought that salmon have existed since the age of glaciation two million years ago. Some scientists believe that salmon were originally fresh water fish and were then pushed out of their range and into the salt water areas because of cooling temperatures. Another theory suggests that at the end of the Ice Age when glaciers began to melt, creating rivers and lakes, there was little difference between river water, fresh water and marine water. Still others believe that salmon were originally marine fish and adapted anadromous (able to survive in both fresh and sea water) behavior during the Ice Age. Atlantic salmon have been important to man for thousands of years. Etchings of salmon appear among the 20,000 year-old artifacts of Cro-Magnon man. Atlantic salmon's scientific name, Salmo salar, comes from "salio" (the leaper) named by Roman legions in the year 100 B.C. Atlantic salmon can leap 9 feet! For centuries, annual migrations of Atlantic salmon provided food and sport in Britain, Europe, Canada and the U.S. It was a common and prolific fish in the rivers of colonial America. Great numbers were netted and speared. But beginning in the 1600's the numbers began to decline because of the construction of dams and because of pollution. Important spawning beds were lost when dams were constructed and when the waters became polluted because of the Industrial Revolution. The natural range of Atlantic salmon includes the sub arctic North Atlantic Ocean basin and rim. Its oceanic feeding range includes waters surrounding southern Greenland and Iceland. Its freshwater habitats, both for spawning and rearing, extend as far south as Spain on the Bay of Biscay in the east and to the Gulf of Maine in the west. Atlantic salmon are world travelers. Salmon from Western Europe, Canada and the U.S. will migrate to their normal feeding grounds near southwestern Greenland. One fish originally tagged in New Brunswick, Canada was captured and released near Norway and again in a New Brunswick river. 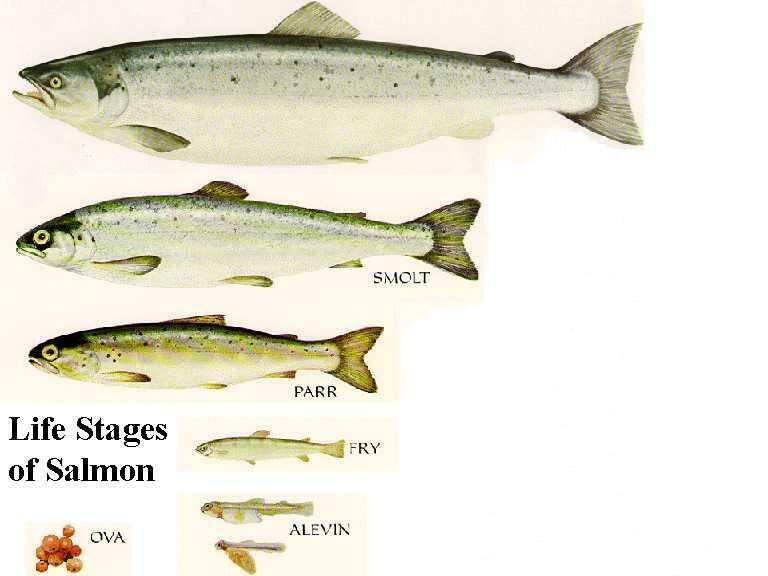 The life cycle of Atlantic salmon is typical of anadromous salmonids i.e. fish that run upstream from the sea to spawn. Spawning is in cool freshwater streams. Eggs are buried in well irrigated gravels where embryonic development occurs over a period of weeks or months depending on the temperature. Hatching, when alevins emerge from the egg shell, occurs midway in development. Alevins are capable of movement, but remain within the gravel interstices until the yolk sack is exhausted. When development is complete, the fry emerge from the gravel. Emergence is in spring and the fry are able to feed on bottom dwelling or drifting organisms such as the larva of insects. In order to survive in the stream they develop camouflage and at this point are called parr. A dark back and nine to eleven dark bars on their sides called, parr marks, separated by a single red dot marks this stage. 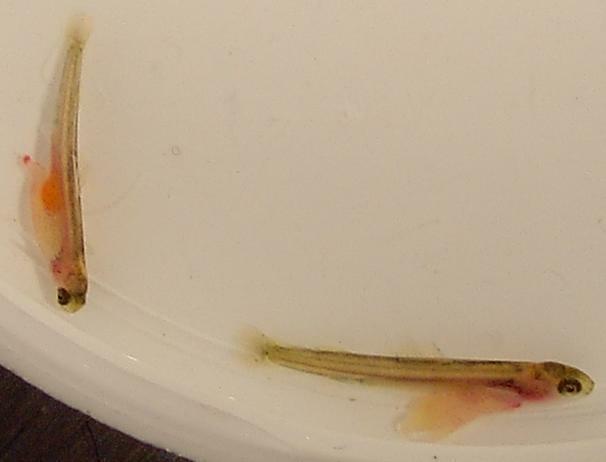 After one to several years of growth (12-24cm) in fresh water streams, parr either mature (rare) or go to sea as smolts. The transformation from parr to smolt is a complex physiological and morphological change in which the fish loses its parr-marked coloration, becomes silvery and has the ability to live in seawater. After one year or several years at sea, the salmon mature and make their return migration to their natal stream, completing their life cycle. Fish that have spent one year at sea are called grilse, weigh about 1-3 kilogram(kg) and are sexually mature. Adult salmon may weigh up to 10 kg or 22 pounds. Both grilse and adult salmon may complete several migrations and spawnings in their lives unlike all Pacific salmon which die after spawning. Although Pacific salmon are farmed in Japan, Chile, Canada and the U.S., Atlantic salmon still accounted for 90 percent of the world's total in 1993. The world's 470 salmon hatcheries and more than 1000 salmon farms produced 345,000 metric tons in 1993. The New Brunswick industry alone is worth more than $100 million. We risk losing the Atlantic salmon as a free swimming species unless steps are taken now. The entire population has decreased so significantly that restoration procedures must be enacted or we risk losing wild Atlantic salmon forever. In addition, conservation projects are in danger of being cut back or reduced just when salmon need them the most. Budget cuts and hatchery closings are leaving America's Atlantic salmon in the hands of under funded and overstretched agencies.